Developer Far East Consortium has unveiled its expansive green rooftop garden atop its 2,500 apartment Upper West Side development. Spanning over 4,000sqm, and situated 25 metres above the street, the rooftop has been developed to create a new benchmark for green inner-city spaces. Urban Melbourne was invited on a tour of the development by the project team. Upper West Side rooftop garden. Located in the heart of Melbourne’s CBD, on the site of the former Lonsdale Street powerstation, Upper West Side’s communal rooftop represents almost one acre of landscaped podium rooftop gardens, lounge areas, barbecue spaces and ‘The Bouldering Cave’, an innovative horizontal rock-climbing wall area. A resort-style pool will be added to the mix upon completion of the Manhattan building and its associated podium, thus completing the expansive rooftop area. While a fifth tower aptly named 'The Fifth' will complete the rebranded Rose Lane frontage to the development, it is seen as a stand-alone project independent of Upper West Side with its own podium and rooftop. Designed by Cottee Parker Architects in conjunction with njr and associates, Upper West Side’s green rooftop amenity represents an investment in excess of $3.5 million and includes a range of soft and hard landscaping features to enable greater recreational opportunities for residents, setting a new standard for inner-city living. There are 40 species of trees and plants with the trees ranging in age from 8-25 years. Water is drawn from the rainwater collected on the rooftop and grey water from the Midtown tower's showers. The gardens draw on rainwater collected from the rooftop and grey water. Architect Shane Williams of Cottee Parker Architects describes Upper West Side’s rooftop space as a garden in the sky, designed to allow residents and their visitors the opportunity to relax in a space as close to a natural environment as possible despite living in an apartment building. When designing Upper West Side’s outdoor rooftop spaces, we carefully considered how each plant would establish over the next 10 to 20 years, choosing plants that had colour, vibrancy and variety, with fruit-bearing, flowering and edible vegetable species included to ensure we could create a as well as sensory- pleasing garden for residents. Each rooftop space varies in size, weaving in and out between buildings, with the various podiums and tower roofs not only offering various levels of quiet and intimacy for residents but also designed to capture optimum rainfall, to in turn irrigate and cultivate all on-site planting. Urban forestation is very topical at the moment and we were keen to embrace this as much as possible with Upper West Side. In addition to notably lowering peak temperatures caused by hard-surface heat radiation, the rooftop design will retain storm water flow for continued plant growth. Another key point of difference to Upper West Side is ‘The Bouldering Cave’: an area devoted solely to a set of rock climbing walls. 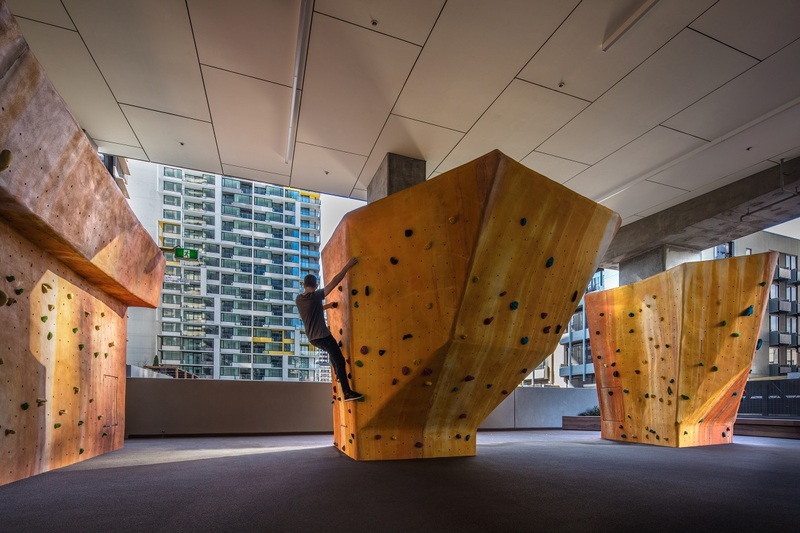 Strategically positioned, the walls have an organic appearance and are crafted with a cementitious material, while the floors manufactured with a recycled rubber material, to allow residents to feel they are climbing on actual cliff faces. The space also serves the dual purpose of providing wind mitigation to the inner rooftop garden areas. Other amenities include bocce fields, outdoor lounge areas, communal kitchen/barbecue and dining spaces, a 25-metre indoor lap pool and sauna, a fully equipped gymnasium and a shared function/study area. 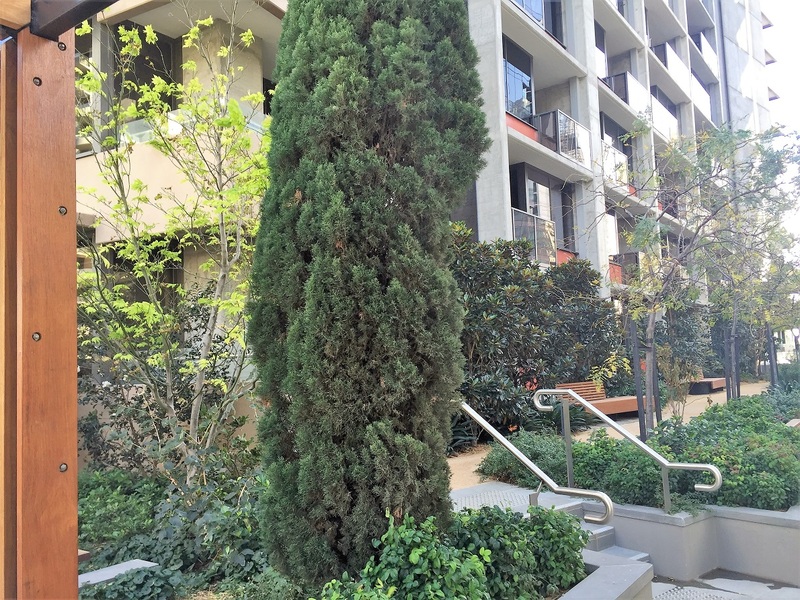 We believe Upper West Side has set a new benchmark for green living in Melbourne’s CBD. Just because we are building apartments rather than traditional quarter-acre blocks, doesn’t mean we can’t also deliver on dynamic green spaces for our residents, too. With such a growing number of apartment buildings, comes a requirement to deliver adequate green spaces and amenity. The rooftop gardens and creative amenity spaces at Upper West Side highlight just how far we can take it. The response from our residents reinforces Far East Consortium’s development direction towards creating expansive garden spaces within each of our projects. 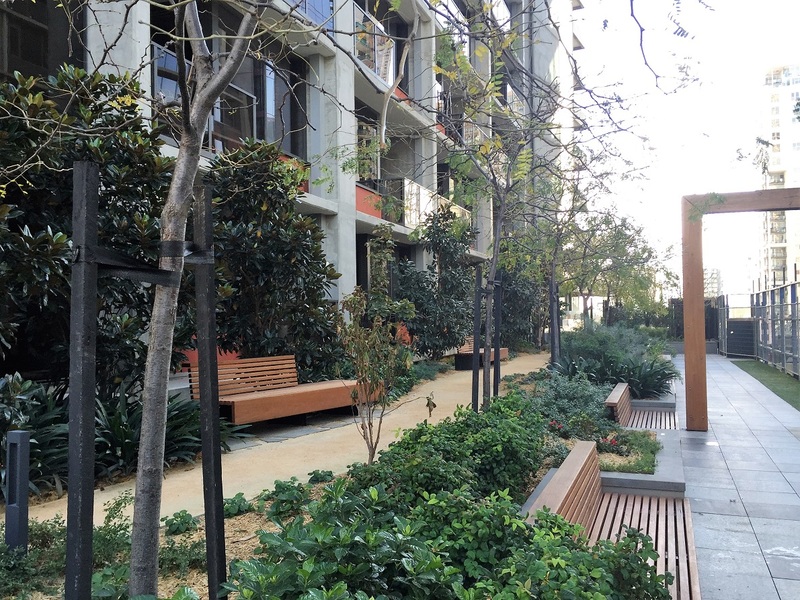 The success of the project really comes down to the shifting trends in the CBD apartment market – green spaces are essentially the way of the future. With Manhattan racing towards completion and The Fifth well out of the ground, both Far East and Cottee Parker's attention now turns to the mammoth $2.5 billion West Side Place development. Located across the road on the former site of The Age, the project represents a further evolution and development of some of the key aspects of Upper West Side. The project is officially due to be launched on the 4th of June but has already attracted strong interest from prospective purchasers. Stage 1 of the project comprises 1370 apartments across two towers and featuring a 263 room Ritz Carlton Hotel, sky lobby and associated hotel facilities, in addition to ground floor retail and food and beverage. Looks nice enough, and good that residents get some green space (a respite for those with views mainly of other flats). But will be in shade except for lunch times, especially in winter, and how was the wind? With tall towers either side, should be a bit of a wind tunnel.... Pleased that the new guidelines might make this a public amenity, not just for residents, and perhaps make sure its high quality all year round, not just rarely usable green stuff. R.F.S. Cert. Arb. (Eng. ), F.A.I.H, IPPS, RH31.